With different borrowers coming and going, shopping through different loan officers, and trying to lock down the right fit for them, making sure that you can quickly and easily distribute new borrower inquiries through your sales team can be key. That’s why Marksman streamlines and automates processes that could otherwise take a long time to complete, risking losing the borrower altogether. Marksman provides a slew of borrower management tools, all designed to expedite internal communication and ensure that each time a lead comes in, your sales team can quickly and easily communicate with the borrower to ensure that someone is always maintaining the fastest possible point of contact. 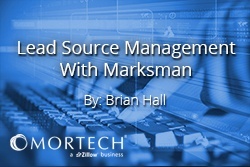 Marksman goes even a step further, fully automating engagement with those leads, through the use of tools such as the Mortech Dialer, which instantly connects a potential borrower with a member of your team as soon as the lead comes in. Marksman not only provides fast and easy ways to connect borrowers, but also features reporting tools that help you figure out what’s working and what isn’t. This allows you to market to your customers while gaining insight into what’s working to bring in leads. These are all just some of the tools that Marksman and Mortech provide to their users, and with our help, your business can bring in more leads, while continuing to maintain and nurture them into clients. To find out more, you can schedule a free, consultative demo with a member of our team today, and find out what you’re missing without Marksman.